Please note: These bird toys are not made in China. In this category, you will find awesome parrot toys, parrot swings, educational bird toys, shower perches, bird perches, bird foraging toys, bird shredding toys, paper rope bird toys and bird toy parts. Enjoy! 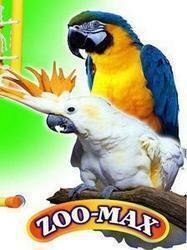 Your Parrot gets double the fun with our Six Pack of Treats as it`s not only a toy... it`s a treat as well! 6 hollowed wooden rings have been stuffed full of delicious seeds for your Parrot to enjoy. When they have finished the tasty centre they then have a new toy to chew. Change your bird's "perch-spective"! Unique vertical and horizontal swinging perch that can be hung anywhere inside your bird's cage or in your pet bird's out-of-cage play area! In the wild, birds climb from branch to branch, using energy and movement. S-shaped perch swing is made from durable, fluted FDA-approved PVC, wood, and paper rope which can be replaced..
Comes with a 6" chain & quicklink not show on the picture. With this Groovy Wood Block treat, your bird will enjoy foraging for hours. Birds love to chew on the groovy part. Made of soft wood. Foraging activity center allows you to stash delicious treats, like Nutriberries, into the grooved block for your bird to find. Block Measures 6" x 2"
These soft pine wood daisies are adorable! Great for toy making! String with Poly Rope, Leather Cord or Paper Rope. Endless possibilities! This is REALY HUGE toy with tons of enrichment! This toy is chock full of 3 1/2" x 1 1/2" Fun Max Groovy Wood Pieces, wood slats and paper string, this toy can also be used for foraging. Place some favorite treats inside the grooves; unwrap the paper rope and insert more non-perishable treats, such as Nutriberries. Recommended for large birds, such as macaws, cockatoos, black palm cockatoos, Galerita Cockatoos and similarly sized birds. Also recommended for some smaller birds, such as caiques, conures and other "high activity" species. Be sure to check out all of our Bird Toy Parts while browsing. Birdie Pizza Bird Toy is designed to stimulate your bird by using a large variety of shapes, colors and textures. This toy is compose of cardboard, wooden blocks and tigtly twisted paper string. Recommended for medium birds, such as greys, timnehs, goffins, amazons, rosebreasted cockatoos and similarly sized birds. 14" (total hanging length). Actual pizza size: 9" x 9" x 3/4"
Birdie Pizza Bird Toy is designed to stimulate your bird by using a large variety of shapes, colors and textures. This toy is compose of cardboard, wooden blocks and tigtly twisted paper string. Recommended for medium to large birds, such as greys, timnehs, goffins, amazons, rosebreasted cockatoos, macaws, umbrella cockatoos and similarly sized birds. 15" (total hanging length). Actual pizza size: 12" x 12" x 3/4"
This is a HUGE toy with tons of enrichment! This toy is brimming full of 3 1/2" x 1 1/4" Fun Max Groovy Wood Pieces, wood slats and paper string, this toy can also be used for foraging. Place some favorite treats inside the grooves; unwrap the paper rope and insert more non-perishable treats, such as Nutriberries. Recommended for medium to less destructive large birds, such as macaws, cockatoos, black palm cockatoos, Galerita Cockatoos and similarly sized birds. Also recommended for some smaller birds, such as caiques, conures and other "high activity" species. This is a fabulous toy with tons of enrichment! Included in the fun are Fun Max Groovy Wood Pieces, wood slats and paper string, this toy can also be used for foraging. Place some favorite treats inside the grooves; unwrap the paper rope and insert more non-perishable treats, such as Nutriberries. Recommended for medium birds, such as greys, goffins, eclectus, amazons, small cockatoos and similarly sized birds. Also recommended for some smaller birds, such as caiques, conures and other "high activity" species. This is a fabulous toy with tons of enrichment! Chock full of Fun Max Groovy Wood Pieces, wood slats and paper string, this toy can also be used for foraging. Place some favorite treats inside the grooves; unwrap the paper rope and insert more non-perishable treats, such as Nutriberries. Six Pack of 3/8" Sisal Rope. Multicolor, bright rope. 48in length. 6 pieces total. Great for toy making! Safe rope. Kraft paper - great for toy making! Leave woven or unravel. Hide treats inside. Endless possibilities! Fun Max 1/8" Sisal Rope 6 Colors 60"
Six Pack of 1/8" Sisal Rope - 5 feet each for a total of 30 feet. Great for toy making! Safe rope. Keep your bird busy. Lot s to play. Toy with a lots of different wood pieces, leather andsisal rope. Non-toxic. They love to chew on it. Toys with a variety of parts, provide exercice to your bird. Recommended for medium birds to large birds who are not overly aggressive chewers. A HUGE 32" long! Heavy duty chain loaded with narow slats of colorful hard wood to chew, Spiral it or lay flat . Recommended for larger birds or medium birds who are aggressive chewers. Awesome! ENORMOUS! 34" of wooden blocks strung on colorful braided sisal rope. Great for medium to large birds. This toy is awesome! This enormous toy is made up of wood, sisal rope, various plastic shapes, cotton rope and leather. Non-toxic dye. Over 28 pieces of wood in various shapes, sizes, and colors. Suspended along a stainless steel chain and rope. Individual pieces run from 2.5 x 3in to 6 x 2in approx. Recommended for large birds. Offers hours of entertainment and plenty to hold your bird's interest. Made of slices of cardboard and slices of pine wood with sisal rope.The Stacks of Shredding Large provides opportunities to chew and shred as well as allowing small treats to be hidden inside the corrugated cardboard slices for further foraging fun.Great for small to medium birds. Made of slices of cardboard and slices of pine wood with sisal rope.The Stacks of Shredding Large provides opportunities to chew and shred as well as allowing small treats to be hidden inside the corrugated cardboard slices for further foraging fun. Great for medium to larger birds. HUGE!!! Full of color and interesting shapes, the Shredding Coronet Large is made with soft chewable materials. Hide food or treats inside the corrugated cardboard slats and watch your birds natural instincts take over! A fun foraging frenzy as your Parrot climbs around trying to find and then remove their rewards!Great for medium to larger birds. Lots of fun!!! Petardo has 100s of cardboard strips and a two tier cardboard tower where will Parrots start? Maybe they`ll delve straight for the chewable colorful wooden slats or preen on the sisal rope! Your customer could hide some tasty treats for them to find! Parrots love to forage; it is a natural activity that would normally take up many hours of their day. Try hiding food and treats inside the cardboard pieces for your bird to hunt out. Whatever they choose, this is a brilliant toy to help alleviate boredom and stress. Fun Max Sisal Climbing Net 30" x 30"
1/4" diameter sisal climbing net. Adorned with wood pieces throughout. Awesome for smaller birds, such as caiques, quakers, ringnecks, pionus, conures, hahns macaws and similarly sized birds. Don't let your bird become a perch potato!